See the best of everything Washington, DC has to offer – from the National Mall and free museums to neighborhood attractions – with this three-day itinerary. Looking fore more DC trip ideas? Check out these itineraries. The National Mall, home to many of the museums of the Smithsonian Institution, is a great place to start your day. See the magnificent jewels, dinosaurs and mammals on display at the National Museum of Natural History; the airplanes and interactive flight simulators at the National Air and Space Museum; and the stories, arts and crafts at the National Museum of the American Indian. And it's all free of charge. The museums also offer free tours to groups who reserve in advance. The Mall is home to a host of other museums, including the National Gallery of Art, where the U.S.'s only Leonardo Da Vinci painting hangs, while the National Archives, which houses the original Constitution and Declaration of Independence, is a must for any American history buff. Start your evening with dinner at Union Station, where there are a number of sit-down and quick-service restaurants to sample. Plus, the glorious beaux-arts train station is the departure point for tours of the monuments at moonlight offered by Old Town Trolley. For something a bit quirkier, Bike and Roll, Segs in the City and City Segway Tours (for ages 16 & up) also offer evening tours in season departing from other points in the city. Even if you've made the rounds at all the monuments and memorials by day, there's something extra-special and magical about a nighttime tour. Day 2: Take Your Pick! 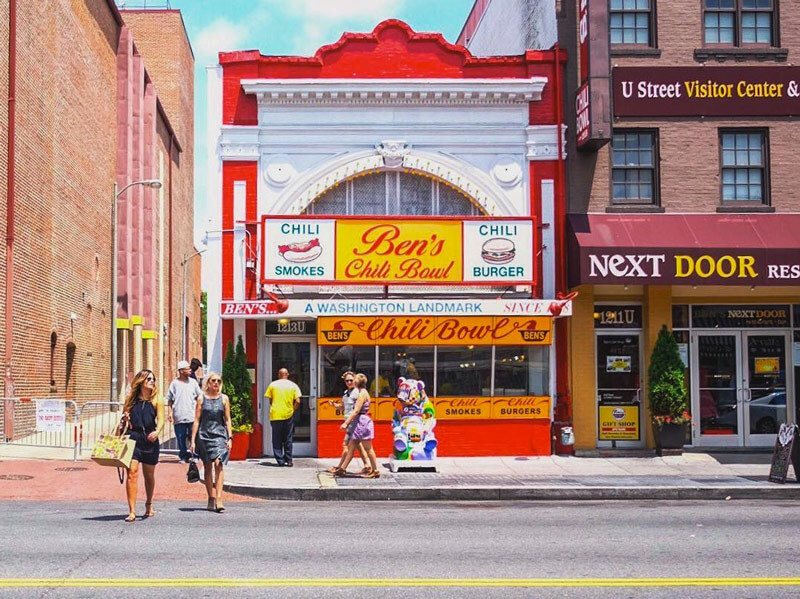 Head to U Street for breakfast at a DC institution, Ben's Chili Bowl. Or, if you're visiting on a weekend, visit the colorful farmers' markets at Dupont Circle or Eastern Market on Capitol Hill. The blueberry buckwheat pancakes at Eastern Market are a local favorite. After breakfast, tour the Capitol Hill neighborhood and explore the U.S. Capitol, Library of Congress and Supreme Court. The neighborhood is also home to the Folger Shakespeare Library, which houses the largest collection of Shakespeare memorabilia outside of England. For lunch, take the Metro to Chinatown, where you'll find an array of options on 7th Street, near the Verizon Center. Or feast on fresh noodles and flavorful soups in Chinatown. And don't forget to snap a photo of the ornate Friendship Arch that looms over H Street. Go undercover at the International Spy Museum, where you can crack codes, take on covers and even lead a covert operation. Or stop by the National Portrait Gallery and Smithsonian American Art Museum to see portraits of some of the country's most famous historical figures. Animal lovers may also wish to pay a visit to the National Zoo, home to our famous giant pandas, cheetahs, tigers and other exotic species. Discover DC's theater scene. The Kennedy Center's Millennium Stage offers free performances many nights, along with a host of ticketed performances from opera to musicals to jazz. Other theaters, such as the Shakespeare Theatre Company, Arena Stage, Warner Theatre and National Theatre, regularly present familiar classics. For something a bit more contemporary, catch a show at Woolly Mammoth Theatre Company. Start your morning in one of DC's prized neighborhood attractions, like the Anacostia Community Museum, The Phillips Collection, Washington National Cathedral, Tudor Place or Hillwood Museum and Gardens, then head to Georgetown for fantastic shopping and sightseeing in a charming historic setting. Sports fans can watch the Washington Nationals, Washington Wizards, Washington Mystics, Washington Capitals or D.C. United in action at various venues around town. You can also get in on the action yourself with miles of trails in Rock Creek Park. In addition to trails, the public park has a planetarium, horseback riding and lovely spots for a picnic. If your group is looking for nightlife, head to U Street neighborhood for nightlife hot spots or live jazz music or Adams Morgan to experience DC's eclectic, international scene. DC's up-and-coming nightlife area, the H Street NE features a number of funky clubs and restaurants. For something slightly more low-key, DC boasts a number of wine bars to get your vino fix. Looking for more ideas for your visit to Washington, DC? Explore even more adventures and itineraries here.